After releasing Land and after their performance at the Summer Breeze last year, which remains one of my most lasting memories, Týr wins a tour de force once again, when it comes to uniting the contemporary present figure of metal with the mythological past. 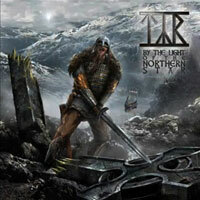 On By the Light of the Northern Star, Týr delivers catchy yet technically brilliant tracks. Their viking essence is still present through the folk rhythms at the basement - and not in the foreground as before - of their art. This time, they've followed a tone that belongs more to classic heavy metal (ie. "Ride"); the folk songs are more rocked up, and they generally keep a harder line (ie. "By the Sword in my Hand"). The compositions are technically more speed, with more dominant solos. There may be less of the old Nordic feeling, but then again, more playing joy translates in each and every song. All this makes the new record less accessible at first, but more durable than the previous one. NB! I was unfortunately not able to get access to the two bonus tracks, which amputated the experience.